For the love of Wine, how to keep track of all the fine bottles, grapes, tasting notes, lest alone the places we have visited over the years. 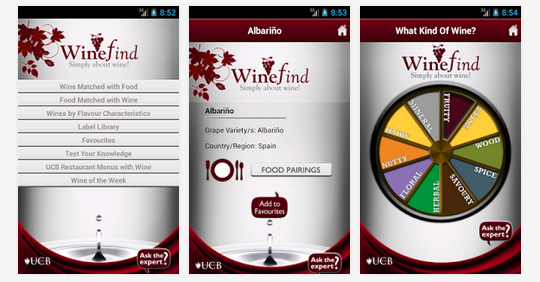 Smartphone users who have been searching for Android mobile wine apps, wine searches, food & wine pairing. On a regular base I’ll browse for new versions, check and use apps, recently I found some new ones and revisited former app. The apps are downloaded on my Samsung Note 3 device. Here’s an overview of wine journaling apps & more. Note: The wine apps use different scoring systems, most commonly given out of 100, 20, 10 or 5 points. Simply wine and food Website no longer active. I had used Vivino a few years back and at the time one of the major issues was that the camera had focus problems, rendering the search function in operable. However after hearing and reading positive reviews I have re-installed the app. True enough the image-recognition is working perfectly, with the feedback from users they have made improvements to the app. A new feature I like is the recommendation of ‘Best wines under €15 right now’ as rated by Vivino users in The Netherlands (location based) over the past month. For e.g. it recommends a Valpolicella Ripasso Superiore 2012 Casa Nostra, €12 ranked #10, based on 86 user ratings with a 4.6 score. For wines it uses a 5-point scale for scores, the above mentioned wine is rated 3 stars. The paid Pro version promises wine cellar management with My Cellar for wine collectors, haven’t heard or read specifically feedback on this function yet. This app really feels like a wine journaling app, Wine Notes has a clean UI, the background is very dark which might lead to viewing problems if used in darkened surrounding or with mood-lightning settings. The wine journal is more comprehensive and allows you to catalog your personal impression on your favorite wines. I have only started using Wine Notes recently and the camera works but lacks a bar-code scanner. It features a dictionary with 100 key terms and uses the 100-scale system, which is based on the American high-school marking system, so the scale starts at 50 (rather than 0) and popularized by the Wine Spectator magazine. Which means that the same Valpolicella wine used as example above has a 83/100 rating using the 100 score scale. The Wine Secretary is an impressive wine journaling and wine search app; with an enormous wine database, wine details, local database of 1000+ wine regions and 70+ varietals, on- and off-line use. On top of all that, adding your own wine notes based on wine style. Like Vivino and Wine fog app following next, the Wine Secretary uses the same 5-point scale for wine scores too. For Dutch readers click for review: Wijn en wijnkelder app Nederlandse beschrijving. The Wine fog app is a new discovery and the first impression just on looks is that it lies in between Vivino and Wine Notes and has the 5-point scale for wine scores as well. Different from the other apps, Wine fog backs up all of your data into the cloud in case you switch phones or use multiple devices and is suitable for tablets. Another impressive app built around Winesearcher price comparison engine, listing almost 7 million bottles from 50,000 merchants around the world. Assisting millions of people locate, price-compare and purchase quality wines, beers and spirits. If you want to find the best vintage or a wine shop nearby, just type in a name or take a snapshot and their label recognition scanner will quickly present you with ‘location based’ recommendations with the best value bottles and answers. They have added a a camera for snapshots still in beta mode, in the settings you can modify your preferences. Next to the where to buy information, is an overview of wine details, wine producer information with even a price history and search rank based on Wine-Searcher popularity of last year. Under the vintages you will find the year with and a 100 score scale rating and if available an average price. For newbies to Wine and Food pairings with a new feature, adding desserts pairing and wine of the day advice. The beauty of this app it fills in the gap of wine and food pairing with feathered and furred game dishes, it has a comprehensive section with recommendations. “The app, developed in partnership with Halesown-based Smartphone Media, works as both a training tool for hospitality students, a point of reference for industry professionals and a bank of knowledge for anyone who loves food and wine but isn’t sure how to get the best out of both”. Excerpt Wine matching app Wine find taken from the Daily Mail’s interview with the app creator Amy Hollier, click on the highlighted link for full article. This is a new app which I had downloaded a few months earlier, at first glance you’ll notice immediately the use of rich feature images very appealing visuals. However I was very disappointed with the QR scanner not working and not able to add wine notes, I decided to remove the app for now. Left a review comment on which I received promptly a reply from the developers. Thanks for the feedback. The QR scanner works with url supported codes, unfortunately not every wine producer uses these. You can add your own wine notes from the main menu. Please check back soon, we’re adding tens of thousands of new wine records to search! It is a promising app worth to mention and hopefully the feedback will speed up the next version with improvements. Which of the above wine apps are you using already, share your findings and experience or your favorite by sending a comment on this post.